[Episcopal News Service] Presiding Bishop Michael Curry has collected five of his most notable sermons, including his royal wedding sermon, in a book that will be released on Oct. 30. 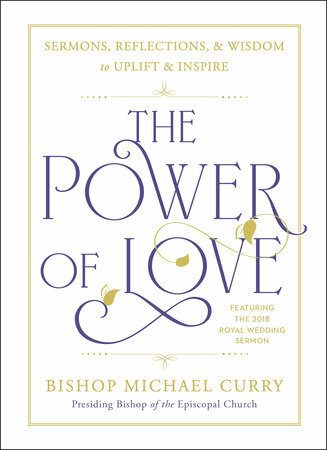 “The Power of Love” takes its title from the theme of Curry’s May 19 sermon for Prince Harry’s and Meghan Markle’s wedding, 13 minutes of preaching that elevated Curry to worldwide renown, though the five sermons span his three years as head of the Episcopal Church. Three of the sermons are from July, when he preached during the church’s 79th General Convention in Austin, Texas, and the fifth is his 2015 installation sermon at Washington National Cathedral. Hardcover copies of “The Power of Love: Sermons, Reflections & Wisdom to Uplift and Inspire” will sell for $20. It is being published in the United States by Avery, an imprint of Penguin Random House, which plans to send a courtesy copy to each diocese of the Episcopal Church. Curry told Episcopal News Service in an emailed statement that he began talking with the publisher before General Convention about turning his royal wedding sermon into a book. The publisher later asked if Curry had more material, so he suggested the three sermons from General Convention: at opening Eucharist on July 5, the revival on July 7 and the prayer service July 8 outside the Hutto Detention Center in Taylor, Texas. Curry is due in London at the end of this month for the book launch. “The Power of Love” will be published Oct. 30 by Avery, an imprint of Penguin Random House. “The world has met Bishop Curry and has been moved by his riveting, hopeful, and deceptively simple message: love and acceptance are what we need in these strange times,” the publisher says in its online description. The presiding bishop isn’t new to the book world. His 2012 sermon at General Convention generated plenty of attention within and outside the church and led to his 2013 book, “Crazy Christians.” A follow-up, “Songs My Grandma Sang,” focused on his faith upbringing and was released in June 2015, the month he was elected the 27th presiding bishop of the Episcopal Church, the church’s first African-American leader. 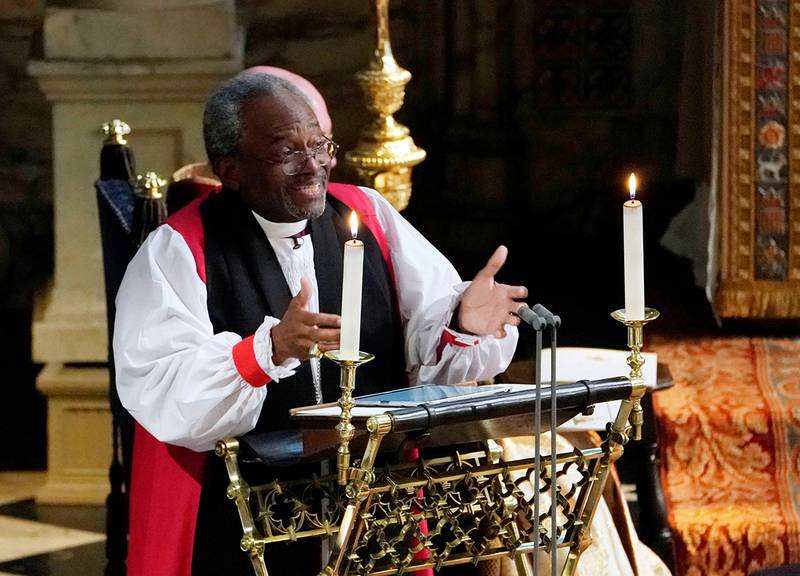 Curry’s past acclaim, however, offered no precedent for the intense global buzz and widespread praise he received for his royal wedding sermon. For a week afterward, Curry was interviewed or profiled by seemingly every major media outlet, from the BBC to ABC’s “The View” to the celebrity gossip site TMZ. In the introduction to “The Power of Love,” Curry describes how he received the invitation to preach at the royal wedding and how he approached the task of crafting a sermon that would be heard by a billion or more people around the world. He emphasizes, as he did in his post-wedding interviews, that his focus was always on the young couple and their example of love. Video and text of the May 19 sermon are here. The text was “edited lightly so that it is more suitable for reading,” Curry notes in the book’s introduction. Curry and thousands of other Episcopalians gathered in Austin for General Convention just six weeks after the royal wedding sermon. The General Convention sermons expanded Curry’s message about the power of God’s love. 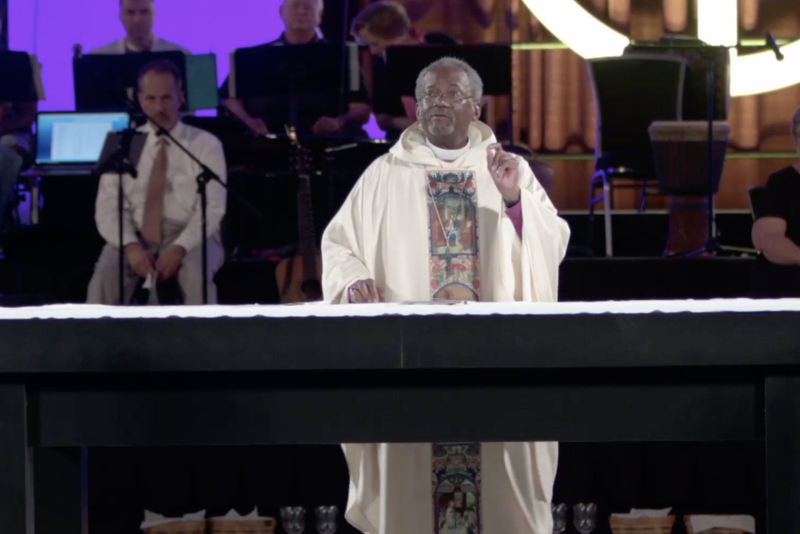 Presiding Bishop Michael Curry introduces The Way of Love during his sermon July 5 at the opening Eucharist of the 79th General Convention in Austin, Texas, in this image taken from a Episcopal Church video of the sermon. The book’s second sermon, from the opening Eucharist at General Convention, is titled “Living the Way of Love.” At that July 5 service, Curry described seven practices to help Episcopalians lead a Jesus-centered life as he unveiled the Way of Love as a churchwide rule of life. Video and text of that sermon are here. It is followed by “The Good Life” from the Austin revival. Curry preached for nearly 45 minutes on July 7 to more than 2,000 people in the Palmer Center, with thousands more watching online video feeds of the service. “God is love. And guess what, that’s the reason we are here,” Curry said. Video and text of that sermon are here. The third sermon during General Convention, titled “Love Your Neighbor,” was part of an off-site prayer service July 8 at a detention facility for women, including immigrant detainees. About a thousand Episcopalians joined the service in public witness to federal immigration policies that had separated families. “We come in love,” Curry told the crowd. “I would submit that the teachings of Jesus to love God and love our neighbor is at the core and the heart of what it means to be a follower of Jesus Christ.” Video and text of that sermon are here. The publisher is working with Episcopal bookstores to stock the presiding bishop’s book. No book tour has been announced, though Curry is scheduled to appear at 7 p.m. Oct. 30 at a book launch event hosted by London’s Southwark Cathedral. The post Presiding Bishop Michael Curry to release book of sermons, ‘The Power of Love’ appeared first on Episcopal News Service.